Shop owners, Beth and Carol, opened Quilter's Garden in Princeton, IL in March of 2000. We have grown and expanded the shop by adding a loft and remodeling the apartment above the shop to use as a retreat center-Stairway to Stitchin'. Running a shop is crazy fun and keeps us crazy busy, but we love it! We enjoy helping customers with quilting needs. Our motto is-"If we don't know the answer, we'll make it up!" As you might guess, we love to have fun! We may be a little bit zany, but our joy comes in helping customers produce works of art for themselves and for gift giving. 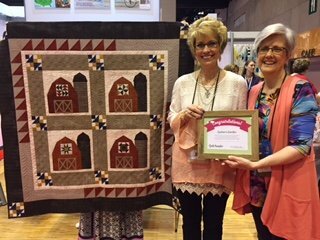 We received the honor of being in the Fall 2017 issue of Quilt Sampler magazine. It has been an amazing journey to become part of this elite group. We have been on Cloud 10 since receiving the call from Lisa that we were chosen to be one of the 10 featured shops. The icing on the cake was finding out our quilt was chosen for the magazine's cover. We have been truly blessed! We hope you will enjoy looking around our website and hope we have the pleasure of meeting you in person at 527 South Main Street in Princeton, IL some day!